Goonie Heights is the second level of World 5 in the game Yoshi's Island DS. It is a dusty, canyon-themed level inhabited by an abundance of Goonies, some of which cannot fly. These Goonies can be essential to the game, as in some points, Yoshi could jump on their backs to reach previously unreachable points. In this level, the player can find Baby DK's Character Coin hidden in a high cliff. This level is very similar to the first game's Goonie Rides! 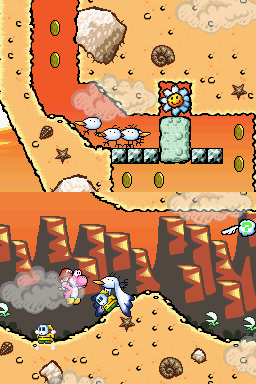 Pink Yoshi begins the level crossing a few pits and facing three Flightless Goonies. Nearby, Yoshi must traverse a longer abyss by jumping on tilt platforms. Reaching the other side, he faces more Flightless Goonies and a Spear Guy, and must go through another gap with tilting platforms. Pink Yoshi gets to the other side, and, while avoiding Flightless Goonies, Woozy Guys and a Nipper Plant, he reaches an area, where he can grab a flower, hidden in a narrow tunnel. Next, even more tipping platforms are seen, as the player must cross a pit, dealing with Goonies. The player must then avoid a Petal Guy and proceed to the next area. Next, Pink Yoshi must step in some floating platforms, and use eggs or Baby DK attacks to reach a flower. After crossing many Flightless Goonies, Petal Guys, an Eggo-Dil, a Piranha Plant and riding Goonies to cross pits to get a flower, the player can proceed to the next area. Next, Yoshi must use Goonies and Donut Blocks to reach a Warp Pipe and the fourth flower. The pipe leads Pink Yoshi to an area containing spikes and Spear Guys, as well as the last flower of the level. The player must use Goonies to avoid hazards, until they reach the goal roulette. Afoafo Asurechikku Afoafo is derived from Goonie's Japanese name 「あほーどり」 Ahōdori, while Asurechikku is from the English "Athletic". This page was last edited on April 22, 2019, at 20:07.